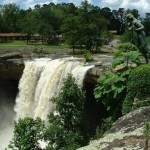 The falls are located on land once owned by R.A. Mitchell, who gave the site to the city of Gadsden, so that the area could be improved, and the public could enjoy the falls. R.A. Mitchell Elementary School, named in his honor, is located across the street from the falls. 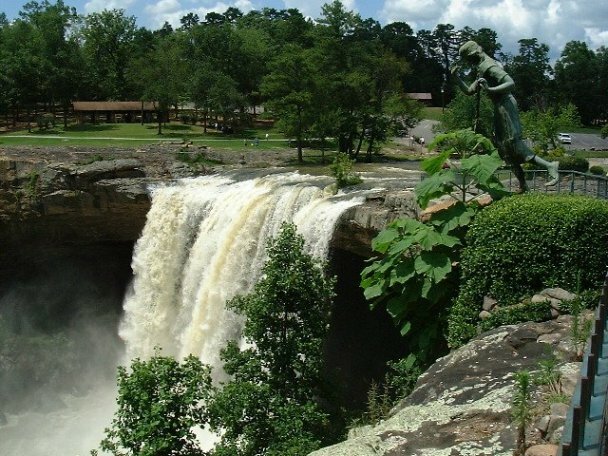 The main feature of the park is a notable 90-foot (27-m) waterfall with a gorge trail winding through its basin and past caves, an aboriginal fort, an abandoned dam, pioneer homestead, and Civil War carvings. The park also features a petting zoo, mini-golf course, the Gilliland-Reese Covered Bridge (built 1899) and a replica 1863 C. P. Huntington train ride. It was listed on the Alabama Register of Landmarks and Heritage on May 12, 1976. The falls drop itself has been run successfully in whitewater kayaks at least once in late November 2011 by three expert kayakers. The water level was unusually high permitting a deep enough pool to form at the base of the falls. Ordinary water levels would not form enough of a pool to consider an attempt to run the drop. The Noccalula Falls Botanical Gardens is an extensive botanical garden displaying over 25,000 azaleas. The outdoor exhibit contains the park’s pride and joy, Shelia; an African lioness that has been a resident in the park since she was six months old. Other animals in the outdoor area are birds, coatimundis ‘ Jenks the Lynx’ Black and Arctic Foxes. The final area of the Petting Zoo is the Pasture which houses ‘Bam the Sheep’, ‘Zeus the Goa’t, and several other animals. There is more information on zoos in Alabama here. Park hours are 9 am to 5 pm Mon – Sat., 12 pm to 5 pm on Sunday. Last ticket sold at 4:30 pm. Wikipedia contributors, “Noccalula Falls Park,” Wikipedia, The Free Encyclopedia,http://en.wikipedia.org/w/index.php?title=Noccalula_Falls_Park&oldid=622423120 (accessed September 1, 2014).